One of the most common, but also one of the most complicated to administer approaches to compensating an employee while they are on an overseas assignment is to use the buildup or balance sheet approach. This approach normalizes the employee’s overseas compensation with what they would earn in a similar position at the home office. 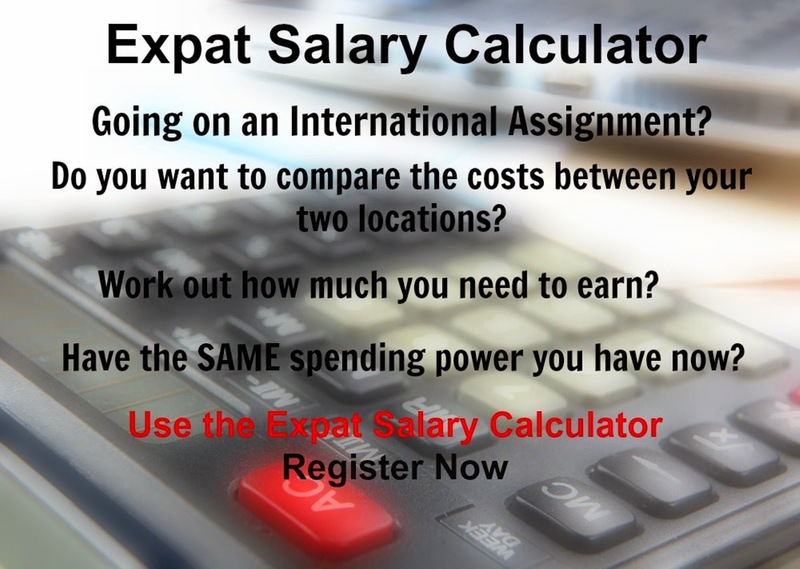 The Xpatulator.com IAM calculator allows HR departments to calculate an equitable package of compensation and benefits during the employee’s overseas assignment. At the end of the assignment the employee is able to maintain the same relative purchasing power and standard of living when they return to the home base salary and benefits structure. The IAM calculator is recommended for extended overseas assignments of from 6 months to 5 years. Here are the major components used to calculate an overseas assignment compensation package. The employee’s home net salary is calculated using their gross cash payments minus any variable payments such as performance bonuses. Hypothetical tax is then subtracted to calculate the net salary. From this amount the employee is expected to spend 40% on essential living expenses and 60% on discretionary spending such as savings, vacations, maintaining a residence at their home location etc. Hardship premiums help to offset relative quality of life issues that employees and their families are likely to encounter while on their overseas assignment. Xpatulator.com maintains hardship ratings on over 700 locations worldwide and calculates a hardship premium based on the relative difference of the hardship rating between the host and home locations. The expatriate premium is an incentive offered to employees to encourage them to take overseas assignments. The international standard is 15% but this number can be adjusted based on company policy or negotiation. The difference in the cost of living is calculated using the Xpatulator.com Cost of Living Index (COLI). The COLI uses price information on approximately 200 common goods and services in each location. Data is verified and updated quarterly by trained analysts. Price information is grouped into 13 baskets of related expenses such as groceries, communication, education etc. The COLI baskets are weighted based on surveys of actual expat spending habits and the applicable COLI uses only those items that the employee will be responsible for paying out of their salary. The host location will typically be responsible for providing housing or reimbursement for housing. 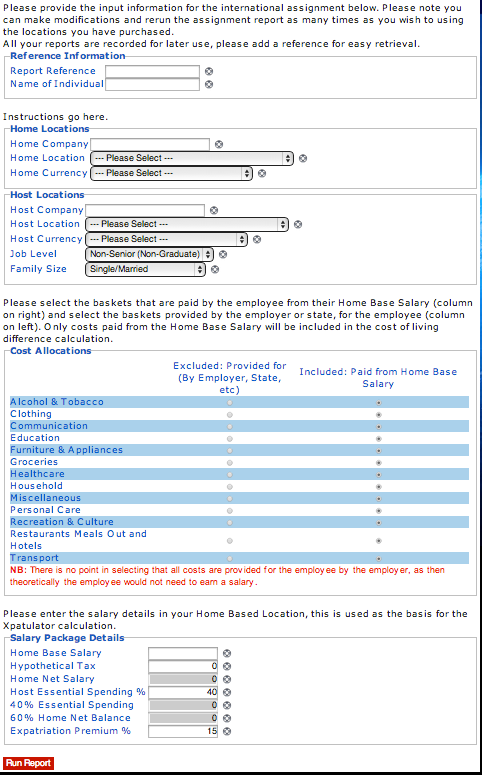 The IAM calculator includes a benchmark housing allowance based on the host location and the employee’s level and family size. If company transportation was provided at the home location, that benefit will typically be extended in the host location. If transportation was the responsibility of the employee at the home location and they will receive company transportation or a transportation allowance at the host location, then that amount should be excluded in the calculation of the employee’s net salary. The IAM calculator provides a benchmark transportation allowance for each host location. Providing appropriate medical services and maintaining equivalent quality education for the employee’s children are normally the responsibility of the host location. Where appropriate, private and/or boarding school may be included. Company benefits such as retirement plans and performance bonuses will continue to be paid as part of the home component of the employee’s compensation package.